Revising the Code provided an opportunity for the Code to evolve and attempt to meet the requirements of the Chartered Trading Standards Institute’s (CTSI) Standards for Alternative Dispute Resolution (ADR). Approval by the CTSI is required to comply with EU DIRECTIVE 2013/11/EU (21 May 2013) on ADR for consumer disputes. This requires the ADR to be provided by a certified body to show it meets the principals set out in the Directive and associated regulations. ADR schemes cannot achieve certification unless they meet strict criteria for impartiality and independence. Low cost for house builders that is! To add to the confusion, complaints can be covered by a different and separately operated Code – the Consumer Code for New Homes (CCNH) – which is not available to buyers with NHBC, LABC or Premier Guarantee warranties. Under the CCNH claims “are subject to a maximum aggregate award of £50,000 inclusive of VAT and maximum awards for financial loss of 25% of the purchase price of the Home and maximum awards for emotional distress and/or claims for inconvenience of £1,000” – far more generous than the “protection” buyers allegedly have with the CCHB! The CCHB annual report (2015) said: “Consumer Code is a central part of the core criteria for the Help to Buy schemes in England Scotland and Wales.” Nevertheless many housebuilders regularly breach one or more of the Code’s 19 requirements as can be seen from the Adjudication Case Summaries which show multiple Code requirement breaches in the 57 homebuyers’ claims that succeeded in 2016. Nevertheless, the awards in these successful cases represent less than a fifth of the total amount claimed by new homebuyers. So what are the changes to the Consumer Code for Home Builders? The Code does not apply to investors now defined as buying more than one property on the same development for investment purposes. Strikingly, for a Code that so few new homebuyers are aware of, with just 55% being given the Code on Reservation (requirement 1.2) according to responses to Q19 of the HBF survey, the requirement to display the Code and give a copy to anyone who asks for it has been removed. 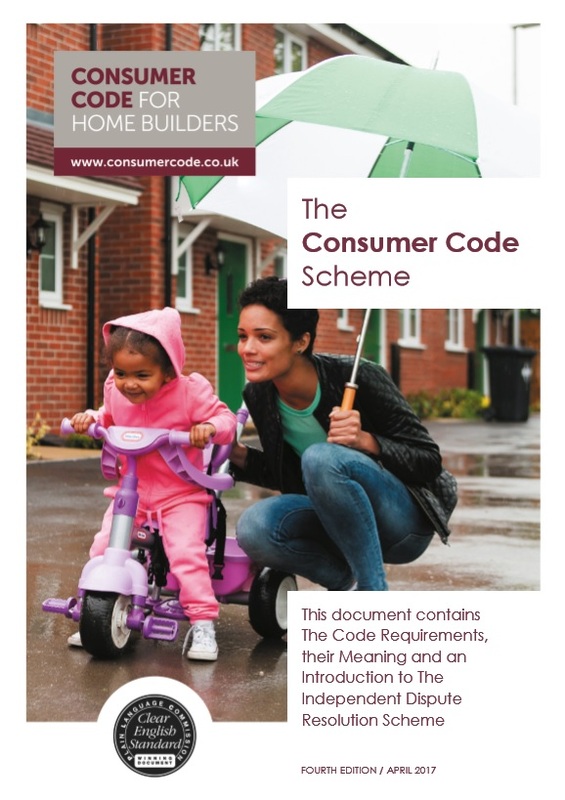 The Code scheme Logo must now be displayed in housebuilders’ and agents’ sales offices and in sales brochures, but the requirement for the housebuilder to inform their customers that further guidance is available and how they can get this has also been removed. Homebuyers must still be provided with the Code (Code Scheme) with the Reservation agreement “but this can be done by electronic means” – a link to the Code website or an attachment in an e mail presumably. 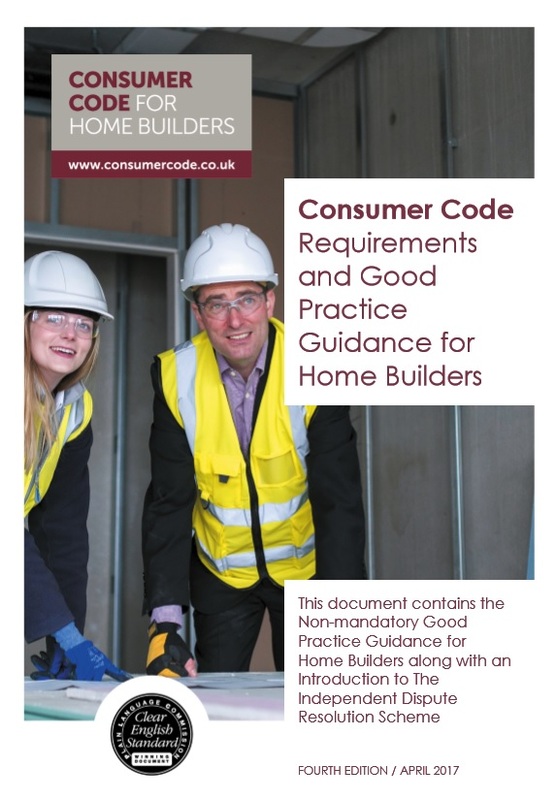 In addition, there is no requirement to provide the version of the Code that contains the ‘House builder guidance’ – essential for those wishing to make a claim using the CCHB Dispute Resolution Scheme. The version with ‘builder guidance’ can be found here but can hardly be considered easily accessible! I recently visited an 18-month old Barratt sales office and can confirm they were no CCHB logos anywhere to be seen. On mentioning the CCHB to the sales advisor, I was given their only hard copy, a second edition CCHB dated April 2010! However, it was confirmed that the CCHB was given to all buyers with warranty details at reservation. All “event fees” such as deferred management charges and fees on re sale must be declared at the Reservation Stage. This is especially relevant to retirement homes, a sector that has been heavily criticised. It will also be relevant to other leasehold new homes especially leasehold new houses. The requirement to be shown “the layout” has been qualified to now show a “general layout” following adjudication decisions made on historic complaints using the dispute resolution scheme, no doubt designed to reduce the likelihood of a claim succeeding. There is a clarification that access to areas under construction may be properly barred or restricted. In other words, you cannot view or inspect your new home until all works are completed. As is often the case, works are ongoing right up to and after buyers legally complete and are given their keys, this has the potential for confusion. No doubt all housebuilders will use this requirement as and when it suits them to do so. It is illegal for a housebuilder to require any homebuyer to use a specified firm of solicitors. Nevertheless, under the Code, buyers can be induced to do so by builders offering incentives such as legal fees paid, part-exchange or stamp duty paid. Reference to specific legislation has been removed. Namely the Unfair Terms in Consumer Contracts Regulations 1999. No doubt to make it more difficult for buyers to find out how they have been wronged. Due to issues surrounding “completeness” of the home at handover, guidance has been extended to suggest that the housebuilder should explain to the homebuyer that there may be “minor items outstanding.” No doubt if there is a written record, this may head off claims from buyers moving into incomplete homes. The definition of “minor items” was not clarified. Builders are guided to inform buyers that they should “give reliable and realistic information when construction of the home may finish”, but housebuilders should “make it clear that they cannot be precise.” So how can it be reliable? Reference to specific legislation, namely the Construction Design and Management Regulations 2007, has been removed. Too many pesky new homebuyers were no doubt using the legislation to report contraventions to the HSE. The most shocking changes concern the so-called “Independent Dispute Resolution Scheme.” From April 2017, a claim cannot be brought until 56 days has passed since first raising it with the housebuilder and no later than 12 months after the housebuilder’s final response. Previously homebuyers had just three months to do this. These changes bring the Code in line with the timeframes set out in the Alternative Dispute Resolution Directive. The award for “Inconvenience” can no longer be claimed by homebuyers! Considering that in 34 of the 57 successful cases in 2016, the £250 maximum payment was all they were awarded, this is certainly a retrograde step, designed to reduce the payments housebuilders are required to make. The very inconvenience of making a claim using the CCHB is enough on its own to justify the payment. However the good news is from 1st July 2017 the maximum for inconvenience is to be doubled to £500, in line with current best practice in other IDRS. The bad news is any “awards will be made by the adjudicator at their own discretion and consideration and where a breach of the Code has been identified.” Worse, a buyer cannot receive an award for “emotional upset and stress, as awards are to be judged as a matter of fact and on the resulting financial loss caused.” Strangely 4.6 of the guidance states that “home buyers may not receive an award for inconvenience alone” but the case summaries would indicate the opposite! Once the homebuyer accepts an award decision, in writing, the housebuilder must pay the award in full, within 20 working days of the adjudicator’s notification. This entry was posted in New Homes and tagged Consumer Code for Home Builders, house builders, new homes ombudsman. Bookmark the permalink. This is very informative and lots of things to learn about the housebuilders’ Code.